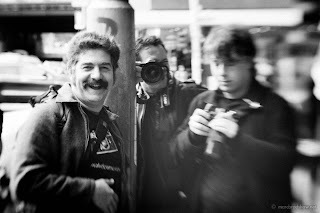 Sunday brought 2 events for the +Melbourne Photo Walkers. Firstly, #thewalkdownunder revisited, a re-walk of the earlier Google+ Australia wide photo walk. Starting at the must more respectable time of 9:30am we missed the early light but didn't have to rise with the sparrows. As a last minute decision I decided to limit myself, and shoot the whole walk using my Lens Baby (double glass optic) lens. This is a selective focus, manual focus lens, with a focal length of approximately 50mm. This also meant limiting the aperture, as changing the aperture of a Lens Baby means removing a small magnetic disc with a certain size hole, and inserting another small magnetic disc with a different sized hole, and this can be fiddly so one tends to stick with an aperture for a while. The shots are a little different this time, due to the challenges of using a fixed focal length, and the unique properties of the Lens Baby. A much smaller group this time, once again starting at Federation Square, and wandering up towards Bourke Street via lane ways and malls. After a (not so) quick coffee stop at Bourke Street the group meandered up Elizabeth Street towards the Vic Market. Elizabeth Street is home to a number of camera shops, and there was some window shopping (and real shopping for some) on the way. After wandering around the Market for a while we regrouped at Flagstaff Gardens, then wandered back through lane ways and alley ways before those who were attending the second event, the moon walk split off and headed out to the Dandenongs. So, as last time, I didn't make it to the end of the walk, and instead headed off to Kallorama to shoot the super-moon, but that will have to wait for another post.